Gigi's Thimble: I'm kind of a loner. I don't have a lot of close friends that quilt. So when one of my bestest (non-quilty) friends told me she wanted to make a quilt (and asked ME if I would help her) I jumped all over the chance. She looked around the Internet and sent me pictures of some quilt blocks she liked. We quickly decided on a string quilt because who could resist such a cute quilt as this? ﻿We roped in two more "non-quilty" friends to join the fun and last night we had our first work-night. I told them not to buy fabric quite yet and that I would supply some for their first few blocks (at least). These blocks were so simple and so fun to make. No making sure you get the right color in the right place. This was such a great project for a newbie quilter. And a great way to use up scraps! We made a big mess (I didn't mind) and had lots of fun. Crush cookies. Mix cookie crumbs and butter. Press onto bottom and sides of 9-inch pie plate. Mix cream cheese, peanut butter, sugar and vanilla on medium speed until well blended. Gently stir in 1-1/2 cups of whipped topping. Spoon into crust. Freeze 4 hours or overnight until firm. Let stand 1/2 hour before serving. Garnish with remaining whipped topping and additional cookies if desired. Special garnish ~ just before serving, drizzle chocolate syrup on plates. Anyways, I know I said this project was a great stash buster, but I had to buy just a few additions today while I was at work. Just a few more colors that I did not have a lot of to make sure it will be bright and colorful. Adding just a few new additions to "old scraps" makes the whole project feel fun and exciting! One perk of working at a fabric store ~ cutting myself 3 inch strips of each one of these fabrics so I would have a nice variety of colors and prints in my quilt. About $15 for all of this (before my discount). Lovely! I wish I had a friend like you. Not only would you teach me to quilt but you'd make some wonderful treats too! Oh...I just know the fun you all had and to show others, that is just awesome. Love your new fabrics! Oh how much fun. :o) And your friend's quilt is not only going to be adorable, but very special too! Such a great project for newbies!!! They look fabulous and really encourage them to move on. They obviously had a great teacher too. Beautiful! How fun to get together and that pie sounds amazing! Super cute! Your friends are so lucky. I think I will try the quilt and the pie. I have lately become more enamored of string quilts. Thanks for showing this, it's got my juices flowing! I'm sorta a loner quilter... most quilters around here are retired and the two guilds meet in the morning during the week. 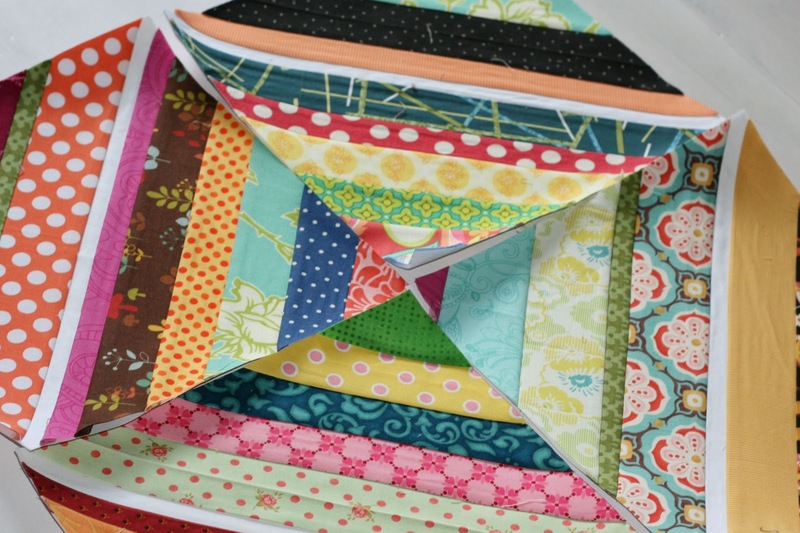 Would love to have a sewing/quilting party like the one you had... what fun! I am a loner quilter too! Being a full time athletic coordinator doesnt lend itself to to many fellow quilters. Love this quilt u are doing with them. Thanks for posting! How much fun is this. Your friends are lucky to have you! It looks great. what a fun time-wish I lived close, sounds like there are lots of loner quilters. Cute quilt-have tons of fun. 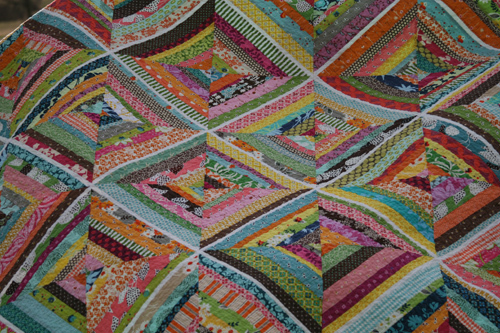 Love scrappy string quilts. They call to me.